Wedding cake trends change with seasons and….just like wedding dress trends. From elegant to soft and whimsical colors, today’s wedding cake captures the personalities of the bride and groom, fits the season, the venue and the flower decoration. 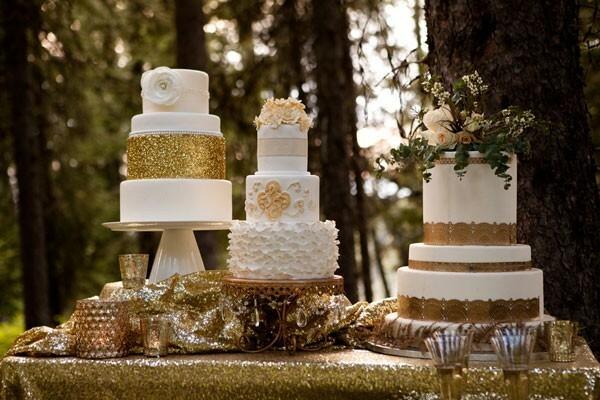 The absolute wedding cake trends for 2015 are metallic frostings and dustings of shine and glitter. Most popular this year is the combination of silver and gold together on one cake. Touched textures, especially tulle and ruffled looks, are highly trendy. To create a soft romantic or vintage style lace patterns, pleats and textured buttercream remain the main ingredients. For modern weddings the texture can also consist of a three-dimensional lattice, herringbone or other geometric forms. Another concept is to cover the cake with black or green fondant and to decorate it by hand to create a chalkboard look. Another trend is that the cake tells the couple’s story: Fondant and different flavor tiers allow space for a lot of creativity and by this way the texture of the cake can be influenced by different design elements – for example by a mix of rustic components and feminine design. Concept cakes with no or only a minimalistic frosting are very popular for budget weddings. Naturally there is the possibility to arrange several types of cakes together – the perfect solution to meet everyone’s taste. In this way a cake-buffet might be the most beautiful kind of presentation and one of the highlights for the wedding. The design of the cake stresses exceedingly the style and the theme of the wedding – so go big with the cake!